Happily Ever After!! : FHE - Halloween!! 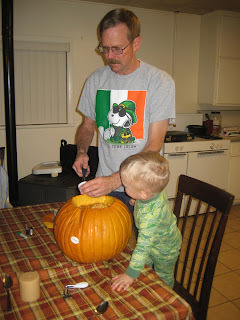 Today Mark and Grant went into town to run around and I mentioned that I thought it would be fun to get a pumpkin to carve for family home evening. 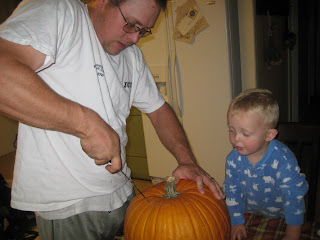 Mark was the best, and got one for us to carve!!! I had mentioned that I thought it would be nice if his family came out to help. My family had been here this weekend, and thought it would be fun for them to do something with us. I enjoy spending time with both families. 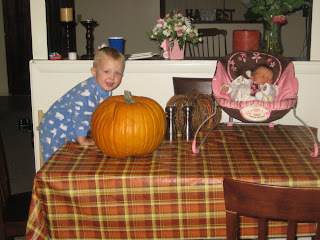 It was great that they were able to come and help Grant with the pumpkin. 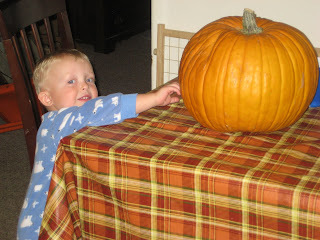 This was the first time Grant has carved a pumpkin, and he thought it was SO cool. 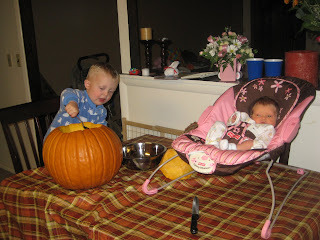 Him and daddy cut the top off, while Cami sat on the side line and watched. Grant and me pulled out all the insides, and let me tell you, Grant LOVED THIS PART!!! Mainly because I didn't get after him for getting dirty. He was able to mess with all the goo, and I watched!! 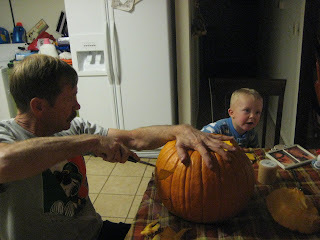 Then Grandma and Grandpa Maroney, Aunt Shelby and Aunt Morgan came out and helped carve the rest of the pumpkin. It was just fun to watch Grant with it. 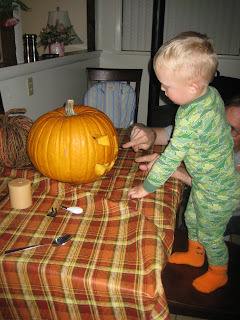 He did get a little restless, and left Grandpa Maroney to most of the carving, but he always came back wanting to know how the progress was going! The pumpkin came out great!! We lit a candle for Grant to see the outcome. I'm very excited for Halloween this year! Grant is old enough to semi-understand what's going on. It was a fun night!! Thanks for coming out!!!!! What a fun Halloween FHE :) Congrats!! Cami is so cute and teeny! Way Fun!Where are you going to go trick or treating?